A man alleged to be one of Mexico’s top drug traffickers has been sent to a San Diego where he appeared before a judge on Dec. 19. Victor Manuel Felix-Felix is accused of managing shipments of tons of cocaine and laundering hundreds of millions of dollars for the powerful Sinaloa drug cartel, formerly run by imprisoned drug lord Joaquín “El Chapo” Guzmán. The indictment accuses Felix-Felix of managing a criminal network which spanned five countries: the United States, Canada, Mexico, Ecuador, and Columbia. Felix-Felix, known as “El Señor,” was indicted by a federal grand jury in San Diego in 2011 and charged with engaging in a continuing criminal enterprise, conspiracy to distribute cocaine, and conspiracy to commit money laundering. He is now finally forced to face those charges. Felix-Felix was arrested by Mexican authorities at an apartment complex in the city of Santa Fe, Mexico, in October of this year. 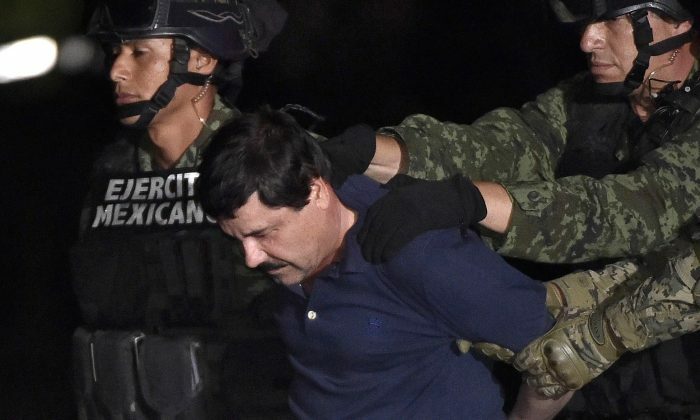 Felix-Felix was more than just a trusted lieutenant to “El Chapo;” he is the father-in-law to one of Guzmán’s sons and godfather to one of Guzmán’s children. Guzmán’s sons, Ivan and Jesus Alfredo, took over the Sinaloa drug operation after “El Chapo” was arrested and extradited to the United States earlier this year. Evidence for the charges was gathered by an agent of the Drug Enforcement Agency, who set up a phony money-laundering operation in 2009, offering to transport cash and drugs in private planes. The undercover agent started out moving large shipments of cash from cartel dealer networks across North America to Mexico. According to the San Diego Union-Tribune, on June 3, 2009, the agent and associates of Felix-Felix met in Panama City, Panama, and made a deal to collect more than $300 million from cartel dealer networks across North America. The money was intended to be laundered through American banks and flown to Mexico. After the first shipment went through smoothly, several similar deliveries were arranged, with cash coming from the United States and Canada, and heading to Mexico City or to Bogata, Colombia. Once the agent had gained the trust of the cartel officials, he flew to Central America to coordinate shipments of cocaine. The first shipment, nearly three tons of cocaine, was supposed to travel from Ecuador to Mexico City. The agent arranged to have it seized by Ecuadorian security forces before it crossed the border. The second shipment, also from Ecuador to Mexico City, was allowed to reach its destination. Agents then seized the shipment after members of the Sinaloa Cartel had taken possession. Felix-Felix and 18 other cartel members were arrested.